Applying false eyelashes has always been a difficult task, whether you’re applying them for the first time or you’ve been doing it for a while now. Numerous things could go wrong. Usually, we find that you get overly excitable for the night ahead and rush your application, leaving yourself looking even worse than before you got started! There are 3 key things to follow when applying false lashes. Firstly, ensure that your workstation is clean (and free from any dust) and also exceptionally well lit. This allows you to really focus on the detail. Secondly, ensure that you get a set of false eyelashes that fit your eye shape. For example, a more rounded eye shape looks best with a shorter eyelash. Aim to pick up a few different varieties, to begin with, to see what works best! Finally, ensure you really take your time with each step. There’s no need to rush, and those few extra minutes that you spend could be the difference between a successful eyelash and starting again for the 8th time. 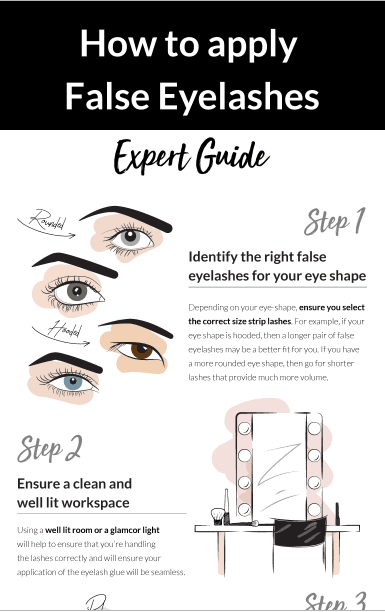 The infographic below from Flawless Lashes identifies 9 key steps to follow when applying false lashes, as given by lash expert Loreta Jasilionyte. Follow them carefully, take your time and you’ll have perfect looking false eyelashes before you know it!